After a 17h trip (flight from Munich to L.A. and then back to Las Vegas) I arrived 9.00 pm at my Hotel. At the Mc Carran Airport I had been lucky again in renting a Jeep Grand Cherokee, my favourite Rental Car. I had driven the Jeep GC the last 5 years and had become accustomed to it, as well loved it. I stayed only one night in Vegas, a Jet Lagged short night, which allowed me to do some Walmart shopping in the morning and still start early around 9 am for the 450 miles (6h30) drive to Moab, UT. I arrived in Moab in the early evening and the weather was cold but fine. 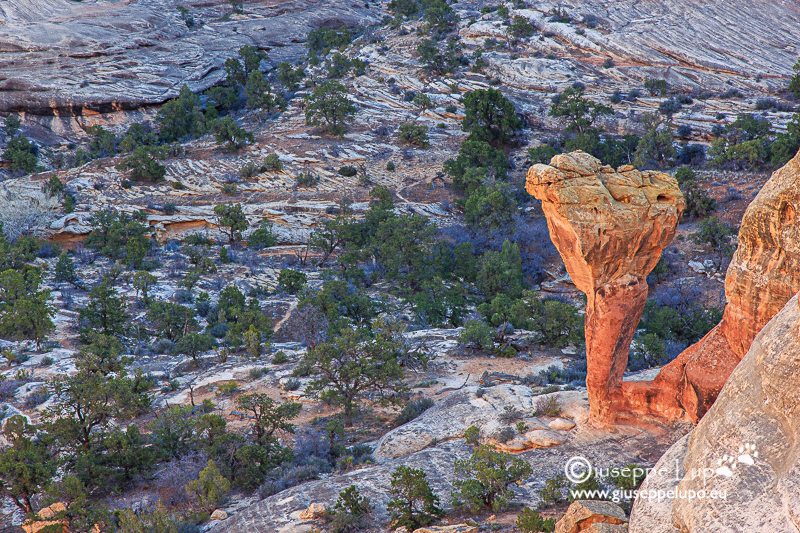 I had some time to drive into Arches N.P before sunset and had a short visit at the Windows Section. 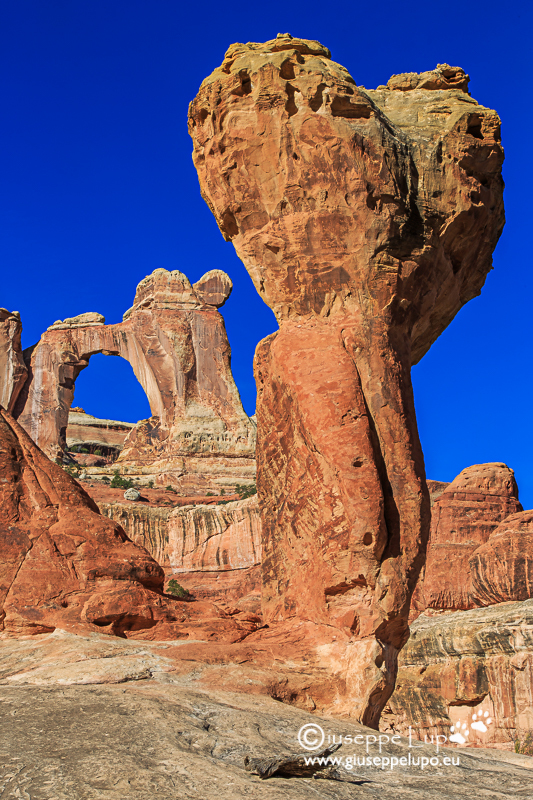 The main purpose of this 2015 US trip would be to finally visit Angel Arch in the Needles district. I had tried twice before: -2013 when I had to give up due to Exhaustion and – 2014 where I had camped the night at Peekaboo Camp but heavy rain in the night, made the hike into Salt Creek impossible. Originally the hike to Angel Arch was challenge enough. 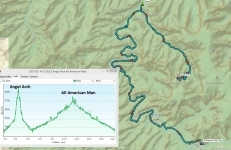 It is a 26 miles (45 km) roundtrip hike. Considering it is best photographed in the morning this would require one night of camping. 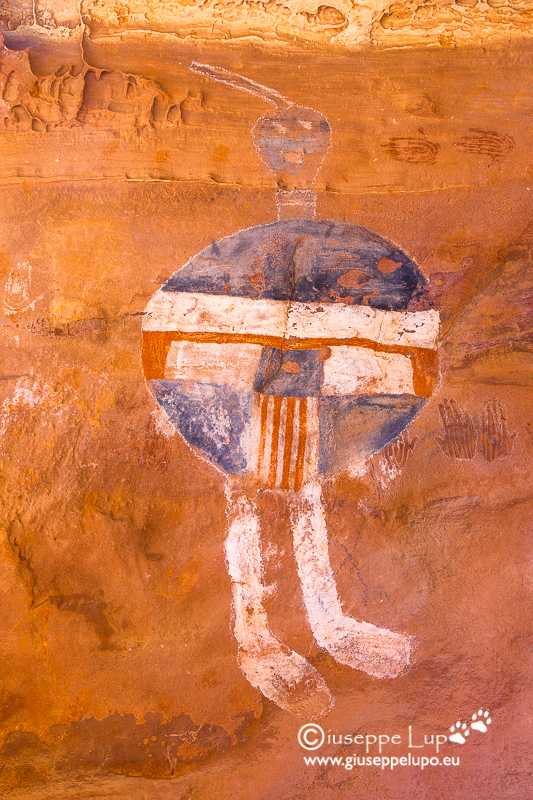 But then I came across Rainer Grosskopf’s report of his Angel Arch hike which he had combined with a visit to the All American Man pictograph. I was immediately exited, when I saw the first time the All American man pictograph, on a photo of his trip report. I had to definetly see that “All American Man” too. 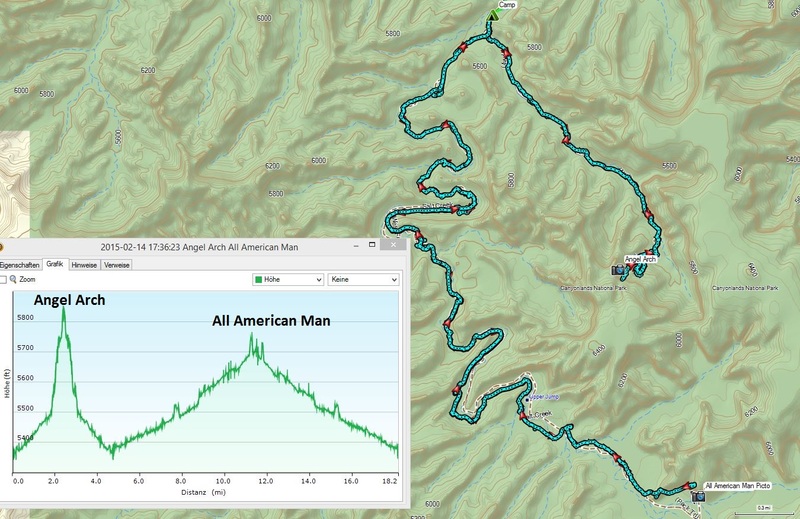 Hiking to the “All American Man” would require another 16 miles roundtrip hike, from my basecamp Close to Angel Arch. My plan was to do a 3 day hike, and stay two nights in Salt Creek. The base camp would logistically be best close to Angel Arch, so I could start in the morning of Day 2, to photograph Angel Arch in the best light and then continue for the 16 miles roundtrip to All American man. I could be back at the camp right before it gets dark. It was february and sunset was already at 6 pm. 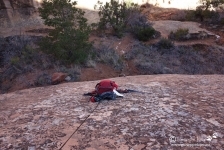 The time for this 16 mile hike was thus limited to 8 hours if i would be able to leave from Angel Arch latest by 10 am. 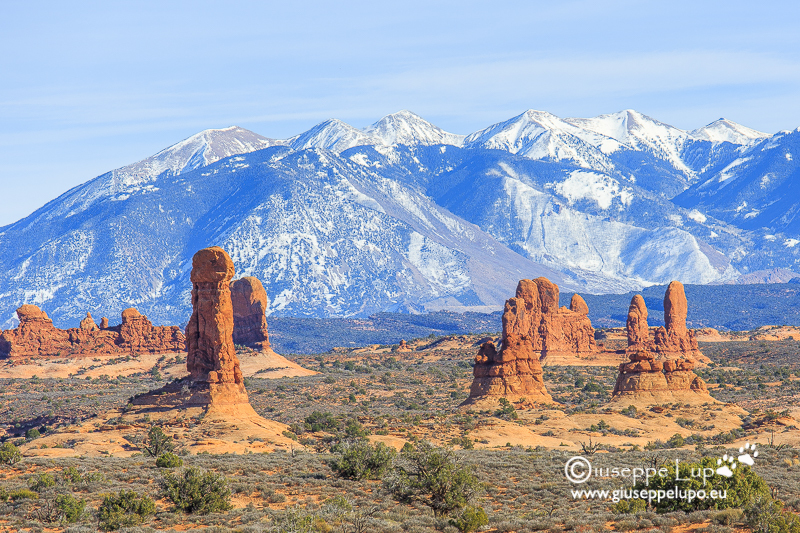 After staying the night in a Moab Motel, on the morning of Friday Feb 13th 2015, I drove up to the Needles district. In the dawn driving up to Needles district I saw more than 50 deers close to the park road. I had to drive carefully. I arrived at the Squaw Flat Parking area at 8 am. I began to pack my backpack for three days out in the wild. The Salt Creek has recently had Bear sightings, so I was told to be prepared to encounter bears there too. The weather had been mild recently, and some bear might have interrupted hibernation. I hoped not, but I was scared. The challenge on this hike would be to carry tent, camera Equipment (tripod, 3 lenses), Food and Water for three days. I dont carry gas cooker and use the water pump only for emergency. My goal was to live from what I could carry with me. I had 10 litres of water for 3 days. That means 10 extra Kilo-gramms of weight. At 8:30 am I began the first section of my hike, via the Peekaboo trail towards the mouth of the Salt Creek Canyon. I had done this 5 miles hike from Squaw Flat to Peekaboo Camp in 2014, and consider it the most attractive hike in the Needles district. So I was pleased to repeat this experience. At Peekaboo camp I had a short break and food. Then I continued the remaining 6 miles up Salt Creek Canyon to my Base Camp. That would be Close to the junction where the hiking Trail to Angel Arch leaves the Salt Creek Canyon. The camp site is called Salt Zone. 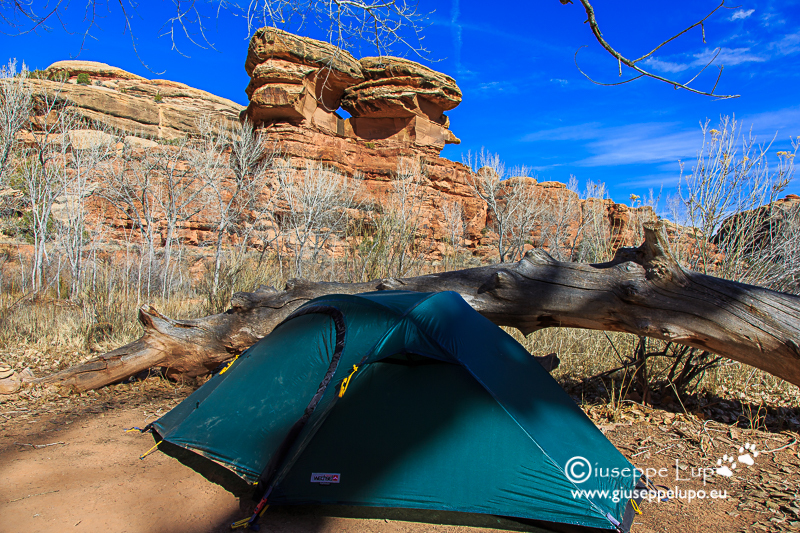 I arrived around 5 pm and had enough time to Setup the tent and check the trail up to the junction to Angel Arch. Thus I would be able to start right away towards Angel Arch on the next morning dawn. It got dark around 6pm and I went into my tent. I yet did not know that the following two nights would be horrible. Falling asleep early, tired from Jet Lag and hiking I woke up in the night and noticed it was cold. I thought it might be 2:00 am, but watching the clock it was only 10 pm. I was shocked, I would still have the whole night in front of me. But worse I was freezing. It had suddenly become really cold. Must have been below 0°C already. It dawned on me that my sleeping bag was not warm enough (I was wearing thermal underwear). The cold still increased and I got aware that I could not sleep under these circumstances anymore. Meanwhile I was shaking. But I could improve the Situation by putting on, all the clothes I had with me, and closing the sleeping bag completly with the upper cord. The night was a Long waiting for the dawn, luckily I could doze off many times for some minutes. I was happy when it got 6 am, so I could climb into the hiking boots and start slowly the hike towards Angel Arch. 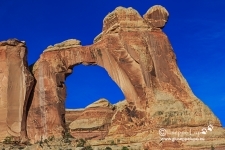 From Rainer Grosskopf’s hiking report I knew, it was not worth to start too early, cause the best light to shoot Angel Arch, would be around 9 am when the sun was high enough, and the main scenery was out of the shadows. Nevertheless I assume I reached the molar already around 8 am, but still tired and looking upwards to Angel Arch I did not see the Molar on my left. So I climbed and climbed, and even climbed up a very steep sandstone section, which was only possible by using a Long trunk for Support. I came very Close to Angel Arch and was wondering where the Molar was. And menwhile I was so close, that i recognized from the fotos I knew, that I must have passed by the Molar already. I looked and thought the Molar must be behind me. Searching for a while I suddenly recognized the Molar in the distance far below me. Most likely few have photographed it ever from this side. 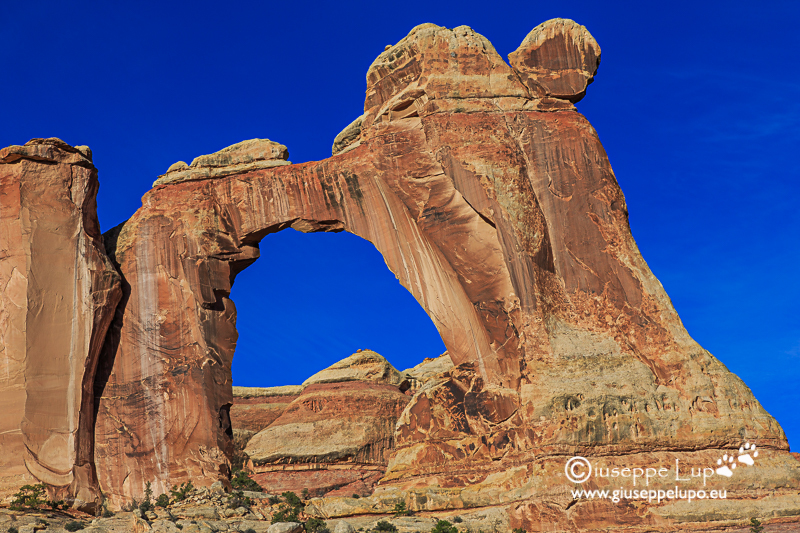 I knew, to get my classic shot of Angel Arch with the Molar, I had to head back down, and hurry to get the best light. Considering the 17 miles hike later in the day, I had possibly lost valuable time. So I hiked back sliding down that steep sandstone cliff where I had to lower my back pack with a rope. 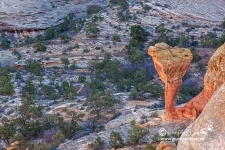 Finally I reached the molar and could take the known shots of Angel Arch, with the Molar lit by the morning sun. But “All American Man” was now already in my mind. I decided to hike back to the Base camp and leave all heavy equipment like tele lens and tripod at the tent. Took 4 litres of water with me. And started around 10:30 am for the 17 miles roundtrip hike, to the “All American Man” pictographs. I knew I had to hurry on this hike, because at 6 pm it got dark and then I would like to be back at the tent. Hiking in Salt Creek in this winter month of February was frustrating and little bit annoying. the grass was high the trail barely visible. As additional psychological stress came the fear encountering a bear. Hiking here, one had often to cross the Creek and search for the trail, sometimes even return from a dead end. Luckily there was not much water in the Creek, everything was possible dry booted. The Creek was still frosted at many locations. Just before reaching the Location where the “All American Man” pictographs should be, there was another beautiful pictograph known as the “4Faces”. Then after a small waterfall and a hike up a ridge I knew “All American Man” Pictograph must be Close. I located it up in a cave at the mountain wall to the left. It was not too easy, to climb up there, to take a shot of the Pictogrpahs from inside the cave. I then had a small break with granola bar and water, noticing that I had only 1.5 litres of water left for the 8.5 mile back to my tent. I had tried to drink as little as possible, and noticed signs of dehydration already. Luckily in this winter month of february, there was no heat, and this helped to not dehydrate too much. I tried to hike back as fast as my remaining power allowed. I arrived exactly 15 minutes before it got dark, back at my tent. Another horrible cold night in front of me. As soon it got dark, I crawled into my sleeping bag and again fell asleep early. But, another time I woke up early at 11 pm. It was getting again cold and colder. I could see my breath in the air. Same like the day before – a whole night not being able to sleep due to the cold, and constantly dozing off only sporadically for a few minutes. The thrid day I got out of the sleeping bag at pre-dawn, noticing that three of my toes on the right foot were numb. Most likely it, was no good idea to sleep with the sweat-soaked socks from the hike to “All American Man”. But the cold was almost unbearable, I was again shaking the whole night. I had slept with the whole hiking wear, like I had returned from the previous days’ 18 mile hike. Just had put on the thermo underpants and undershirt and removed the hiking boots. Those three toes would remain numb for the following 2 month. When striking the tent the air was still that cold, that the condensed water at the inner tent immeadialy froze to Little White pearls. I now had to head back the same hike, like on the first Day coming in. 12 miles from my camp site, to Peekaboo and over the Peeakaboo trail out to Squaw Flat Parking Lot. There my Jeep was waiting with Drinks, dehydration was meanwhile clearly recognizable and even the loss of weight. Hiking down to Peekaboo Camp was quite unspectacular. Too tired meanwhile to enjoy the scenary I had seen already on Day 1. At Peekaboo Camp I had my first break of the day. I consumed my last granola bar and the last bottle of water. I knew I would enjoy the Peekaboo hike, knowing it is only 5 miles back to the car. Knowing also the hike itself is easy to walk, due to a good marked trail, and hiking mostly on slickrock. It is really renjoyable and exiting, including two small easy ladders and a hike through a Peekaboo hole. 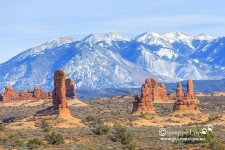 It provides amazing views into Canyonlands and the La Sal Mountains in the background. I arrived at the car at 4 pm. Enough time to go to the Needles Visitor Center to have some refreshing. My next night camp would be the Elpehant Hill Parking Lot. I would sleep the next night in the Jeep Grand Cherokee. I had the hope, this coming night would be more comfortable (warmer), compared to the previous two nights. Elephant Hill was my choice, because the next day I wanted to hike to Druid Arch and return via Chessler Park. Two Locations I had visited in 2012, and kept in good Memory. Who knows If and when I would ever return to Needles district. Summarizing my first 3 hiking days on this 2015 US trip: I had already hiked 12+18+12 = 42 miles (70km) in 3 days.